Sleep in comfort the next time you're out camping in a Coleman ComfortSmart Cot. You'll get the rest you need for a big day of exploring the outdoors on a thick foam mattress and spring coil suspension. 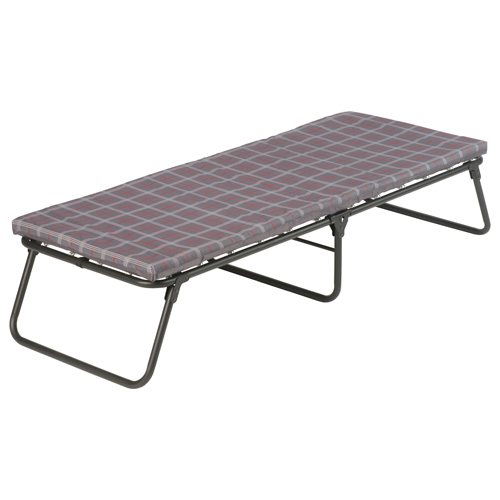 The durable construction of the steel frame supports up to 250 lbs., and it fits campers up to 5 ft. 7 in. tall. When you're ready to pack up, the cot folds up compactly and fits inside most car trunks. Keep the portable, folding cot around all year long. It's the perfect temporary bed when guests visit your home. - Durable construction, heavy-duty steel frame supports up to 275 lbs. - Unfolded Dimensions: 69" x 25" x 15"
- Folded Dimensions: 34.3" x 25.4" x 5.5"